Five Hangs (鹿落五橋 [shikaochi gobashi] or 'deer-fall five bridges' in Japanese) was a lakeside location with steep bridges in Final Fantasy XIV. 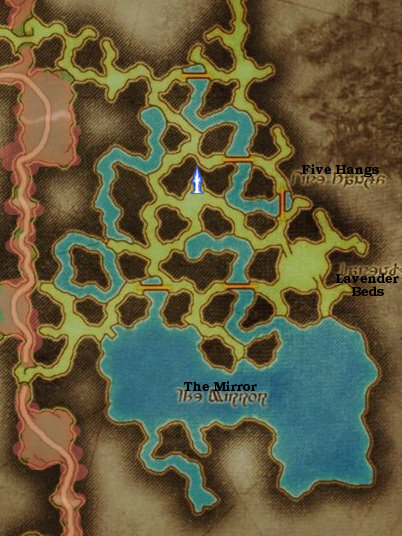 It's in the south-eastern corner of the Bentbranch area in the central Black Shroud, and consists mostly of elevated ground compared to its surroundings. To the south is the lake Mirror, and its rivers run all throughout the Five Hangs area on a lower elevation. In the east is Lavender Beds, which used to be just a field of bright flowers, but was changed into a housing area some 5+ years after the Calamity. Five Hangs itself is no longer accessible from Bentbranch due to the Calamity, although presumably one must still pass through it on boat to get to Lavender Beds.